If you haven't discovered Google Earth yet, it's a really cool tool for photographers looking into a new, unfamiliar area. Just go to www.earth.google.com and download the free program. What you will find are satellite pictures of the entire earth, which in most cases you can zoom down onto for fairly close detail. You can turn on and off things like 3-D buildings, weather patterns, exaggerated terrain features, etc, etc. The "Google Earth Community" also allows viewers to mark certain spots, point out interesting details, even attach photos to the spots where they were taken. I'm sure it does even more than I've played with. In downloading the latest version the other day, I discovered an even handier tool within Google Earth. On the toolbar across the top of the page you can click on a button that activates a sunlight slider bar. So while viewing a certain area of the earth, you can then use the slider to simulate what the sunlight conditions are at that spot throughout the day. 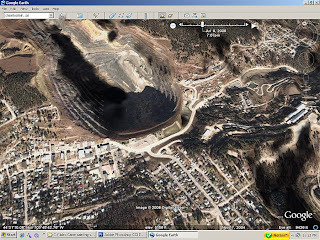 Here is a shot of the Open Cut Mine in Lead, South Dakota with the dark areas representing what the shadows will look like there at 7:07 pm on July 8, 2008. Now is that slick or what? I'm not going to vouch for it being completely accurate, but it should give you a fairly good idea of what to expect at whatever time of day you are contemplating shooting a certain location. So now you don't have to take just my word for it, Google Earth will show you that evening is a lousy time to take pictures of Mount Rushmore!